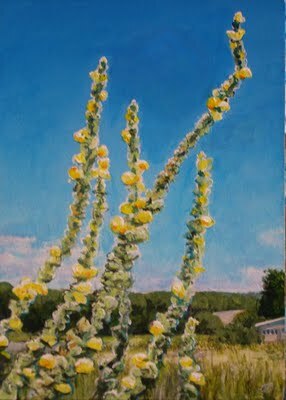 Mullein is a humble plant that has long been used for varied medicinal applications. It also contains compounds used in pesticides. Invisible to most everyone else, the field of mullein in this painting has drawn my attention for the last couple of summers by it's tall stems of yellow flowers against a blue sky patrolled by dragonflies, who'd use the tips of the stems to rest on, all facing the same direction, into the breeze. To me it is a wild patch of flowers, a field full of integrity, a microcosm singing the praises of summer, happily untouched by human hands who are too busy to notice. The painting above, is approximately 5" x 7" on gessoed matboard, the artist's poem handwritten on the back, along with her signature and date.